Tanzanite statement ring in platinum, with diamond accents. 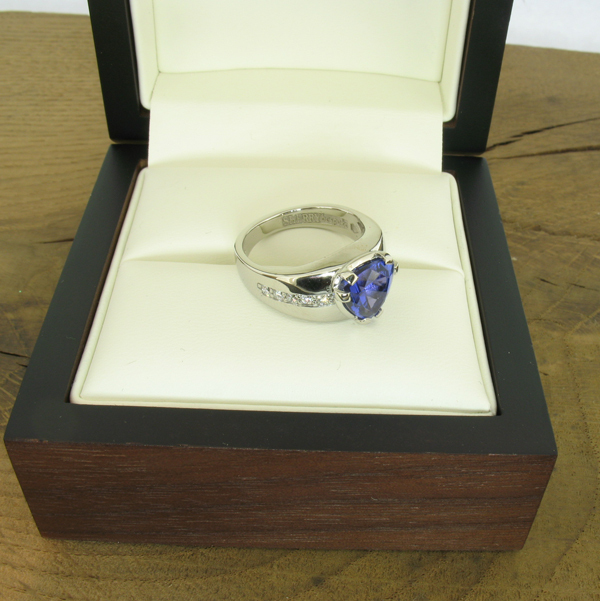 This commission was instigated after the purchase of this exceptional tanzanite from our range of loose gems. The precious stones that we sell are all bought from trusted and reliable sources, many of whom buy directly from the mines and have the gems cut themselves. The majority of our stones are un-treated, which ensures that they will not deteriorate or alter through wear. We buy the higher quality end of the ranges of minerals. We choose the best grade of stones to offer for sale. 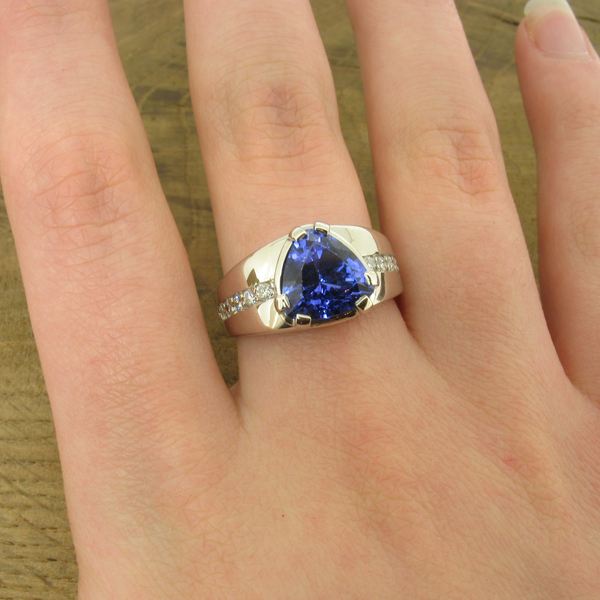 The design brief for this tanzanite statement ring, was that the ring had to be as wide as the stones itself. The client wanted a dynamic ring, with a real ‘Wow!’ factor: Something to be put on for special occasions. 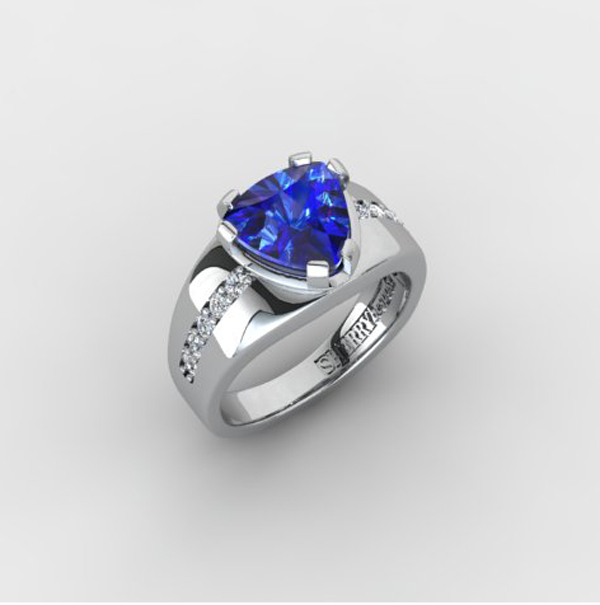 The customer liked the idea of embellishing the tanzanite with diamonds. So we offered a number of ideas which ticked all of these requirements. The lady chose this striking, yet simple design and opted to have it made in platinum, making it a heavy and valuable addition to her growing Sherry Jewellery collection! The tanzanite is a superb trillion cut which we set with double claws to snuggle around the corners. We set the row of diamonds in a grain and channel style, which is a signature setting of ours. The underneath of the design was latticed, as a special decoration, which helped reduce the weight of the ring as well as give the design an ornate detail. It was still a heavy piece, as platinum is the densest of the precious metals that we work in. The tanzanite statement ring in platinum was made to celebrate a special birthday. The majority of our commissions are ordered to commemorate big events, such as engagements, weddings, anniversaries and BIG birthdays. This commission, )like the majority of our pieces,) was made as a one-off; completely unique and original to the client. All of our work is protected by copyright laws and remains our intellectual property. This ensures that our clients are wearing an exclusive and bespoke item of jewellery.